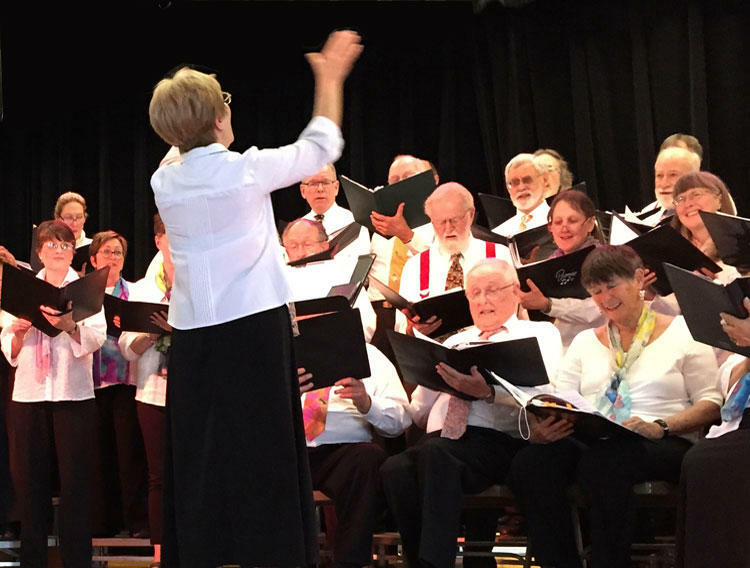 Lake Region Community Chorus starts rehearsals for its 4th annual Winter Concert at 6 p.m. Monday, Sept. 12, at Twitchell Chapel, Bridgton Academy, Bridgton. “The Irish and How They Got That Way,” by Frank McCourt, Portland Stage, Forest Avenue, Portland. www.portlandstage.org or 774-0465. In collaboration with Maine State Music Theatre. “Clue – the Musical,” presented by Schoolhouse Arts Center, Standish, Fridays and Saturdays at 7:30 p.m., Sundays at 2 p.m. www.schoolhousearts.org. “Bonnie & Clyde,” with music by Frank Wildhorn and lyrics by Don Black, Portland Players, 420 Cottage Road, South Portland. Fridays and Saturdays at 7:30 p.m., Sundays at 2:30 p.m. $15-$20. 799-7337 or www.portlandplayers.org. Faculty Concert Series, with Krysia Tripp and Friends, 8 p.m., Corthell Concert Hall, University of Southern Maine Gorham. $5-$15. www.usm.maine.edu/music/boxoffice, or 780-5555. Bellamy Jazz Band, 7 p.m., North Windham Union Church, Route 302, $10-$12, box office opens at 6 p.m.
Storytime at the North Gorham Public Library, 2 Standish Neck Road, Gorham, 10-10:30 a.m. for infants to 3 years. 892-2575. Author Joyce Lovely, will discuss and sign her book, “Ice Cream, Gasmasks, and God” from 6-7 p.m., Walker Memorial Library, Main Street, Westbrook. 854-0630. Auditions for The Nutcracker, Maine State Ballet studios, 348 U. S. Route One in Falmouth. Dancers must be at least 7 years old by Oct. 15, 2016. Dancers do not have to be affiliated with the Maine State Ballet School to audition; all dancers at all levels are invited. There is a $10 registration fee. For more information or to pre-register, visit www.mainestateballet.org or call (207) 781-7672. Dance auditions for Vivid Motion’s “Nutcracker Burlesque!” 10 a.m.-noon, Drouin Dance Center, 92 Bridge St., Westbrook. Seeking both experienced dancers and performers with no dance training. Dancers must be 18 years or older. artisticdirector@vividmotion.org. Author Kevin Hancock, talk and book signing for “Not for Sale: Finding Center in the Land of Crazy Horse,” 6-7:30 p.m., Windham Public Library, 217 Windham Center Road. 892-1908. Author Ron Romano, discusses Bartlett Adams, Portland’s first stone carver and Romano’s book “Early Gravestones in Southern Maine: The Genius of Bartlett Adams. 7 p.m. at Windham Historical Society, 234 Windham Center Road. $5 donation suggested; refreshments. 650-7484. Maine Historical Society, guided tours of the boyhood home of poet Henry Wadsworth Longfellow, Portland. Monday-Sunday, first tour departs at 10:30 a.m. Garden open 10 a.m.-5 p.m. $3-$15. 774-1822 or www.mainehistory.org. Send events 10 days in advance to arts@keepmecurrent.com.